I’m going to keep this relatively brief! DH and I went to Disneyland/LA from 8/30-9/7. Wow…what a long trip. It was the first time we had left our pup where one of us wasn’t home. He spend the week with my parents which means I spent the week a nervous “mommy” away from my furbaby. He did just fine and my parents are great at taking care of him, but I just worry. Anyway, onto the trip itself. Cut to the day of and we got stuck at our layover b/c of a plane issue. They couldn’t decide what to do for the longest time. Then they put us on the plan. Ultimately we were routed to a second layover and switched plans before heading to LAX. We arrived shortly after 2p (womp womp… again). THEN! it took forever for baggage and our shuttle never stopped for us. We ended up getting to Disneyland somewhere around 4/430p. We met up with our friend V and headed to the expo for packet pick up. Oh well (BTW – Disney re-released some of the “I Did It” shirts and I was able to snag them online — they should be arriving today!). 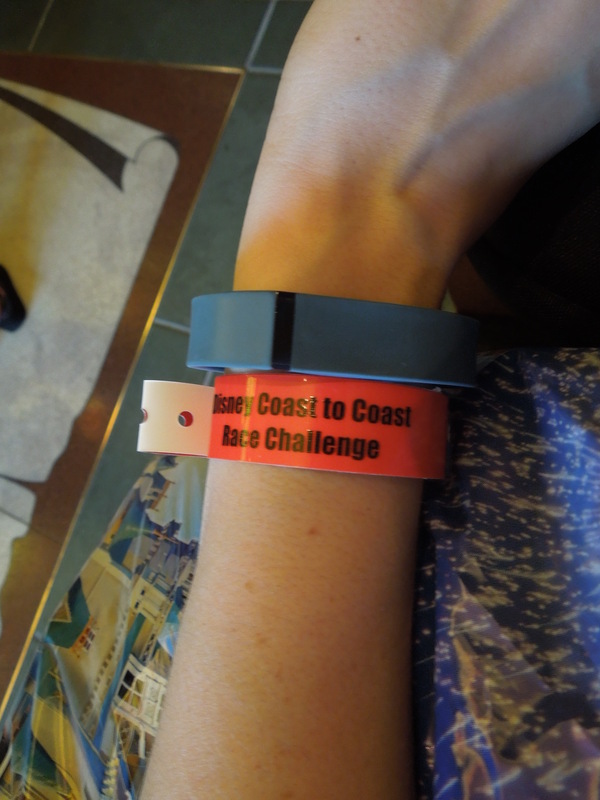 Check out my sweet coast to coast wristband!! My registration wasn’t marked for C2C and I about went into a panic. After a long wait in a second line all was sorted out!! 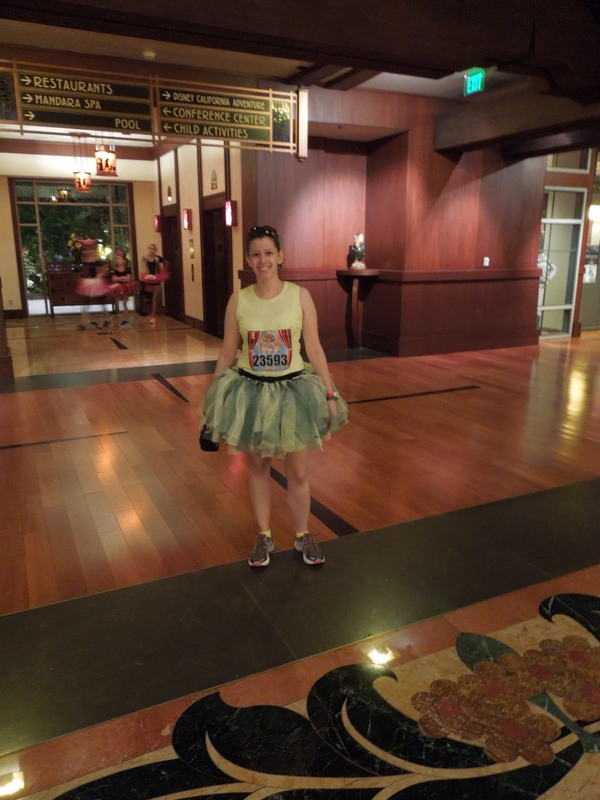 For the weekend, you picked up your C2C band at the expo and your DDD (Dumbo Double Dare) after finishing the 10k. We at dinner at Storyteller’s Cafe (yum) then headed to bed to rest up for the next day! Saturday morning was bright and early for the 10K. Here’s my before and after! After was a the Plaza Inn for Minnie and Friend’s breakfast. 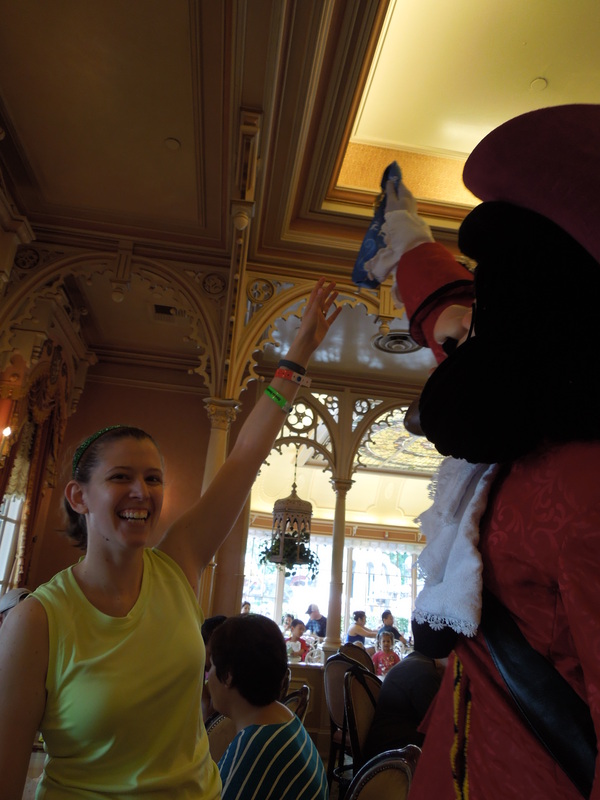 I loved Captain Hook! Sometimes I get bummed b/c characters kind of brush off adult-only tables. But the Captain was ready to play an interact with us! Our plan was originally to run, shower, then hit the park, but timing was off a little. We ran, washed our faces and then headed to breakfast. We had the brilliant idea to hit up Splash Mountain after breakfast (wet ride) and a few others before heading back to shower. Then we came back to the park and hung out. We lulled around Disneyland Park and taking it easy. We were able to get in some good rides (Mr. Toad’s!). But just took it easy. Sunday morning! Another early morning for us. 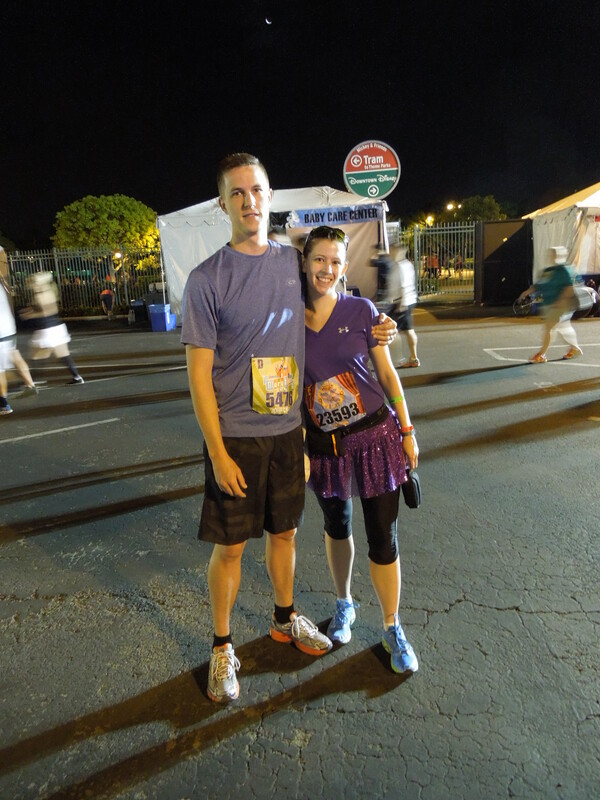 Here’s our before and after for the Half Marathon. The Half was HOT to say the least. It was ridiculous. The sun just glared down on you the ENTIRE race. 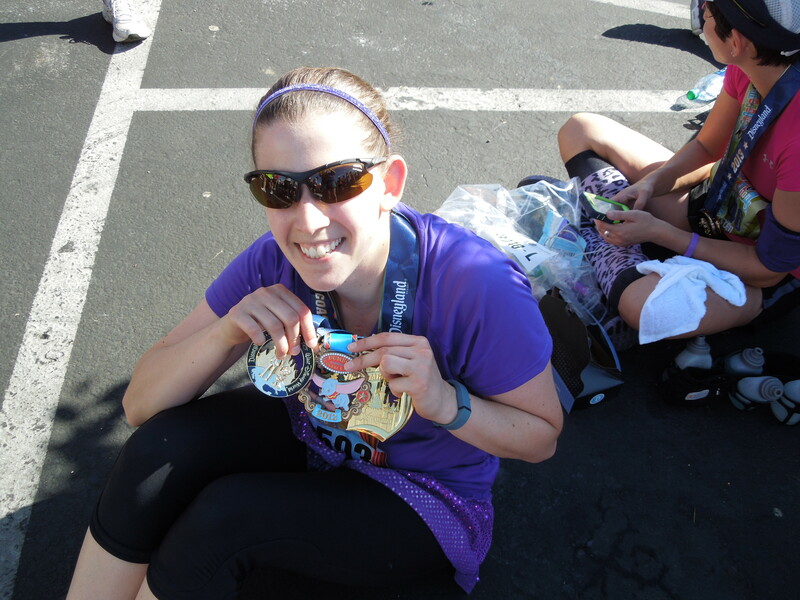 Insane… I was glad DH was there to run with me (his first half marathon!! woohoo!). He kept me going. Around mile 11 I finally accepted his advices to stop being modest and take off my darn shirt. Wow…what a difference! All in all, I was slower than my last half, but not too terribly. I had to stop several times to catch my breath (at the time I thought it was the heat, but now I am wondering if it was the yogurt…). We showered then headed to Cafe Orleans where I proceeded to drop a glass of coke all over the table, myself and the floor (call me butter fingers). I still felt off all day, but we walked over to Disney California Adventure and rode some rides! Dinner was at La Brea Bakery — bring one of these to WDW Disney!!! So good! Monday we hung out in the parks with V until around lunchtime (Tortilla Joe’s!) before we parted ways. We actually met up after dinner (DH and I at Disneyland Hotel) and rode the Matterhorn Bobsleds. DH and I road the Jungle Cruise at night and then called it a night! Tuesday was another park day and Wed we headed to LA. Wed night was caught a taping of the new show “Dads.” where I was Seth Green up close on a bathroom trip!!! Thursday we went the The Price is Right but sadly didn’t get called to “Come on down” If you watch 12/19 you can catch us in the audience, front and center! Friday we didn’t have plans. However, b/c of the delay the prior Friday we had another day left on our Disney park tickets. We decided to see the La Brea Tar pits in the morning and then head to Disneyland to use up the last day on the ticket. On the way home we stopped at In-n-Out burger (my boss said its a must-do!) for dinner. Then Saturday we headed home to our furbaby who we missed dearly!